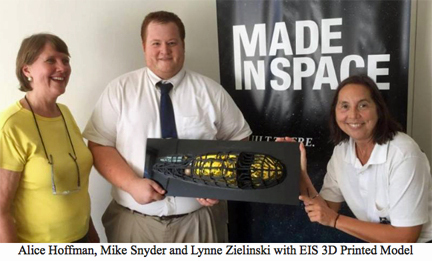 [Satnews] Enterprise In Space (EIS), an international project of the non-profit National Space Society, announces a partnership with Made In Space, Inc., to extensively use 3D printed components in a spacecraft to be launched into Earth orbit. This educational spacecraft will be the first real spacecraft bearing the "Enterprise" name. 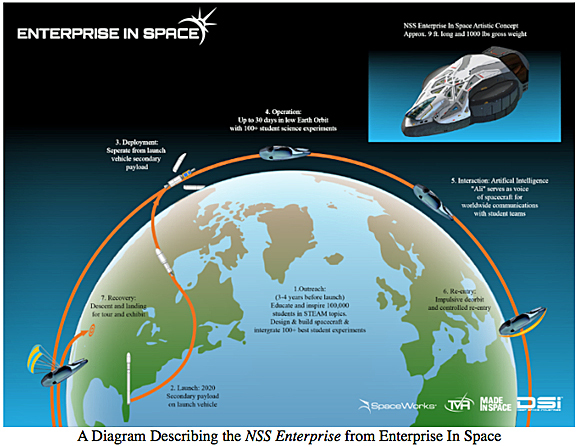 Once in orbit, the NSS Enterprise will be the first 3D printed airframe in space and will also carry more than 100 passive and active student experiments into space and back to Earth. Once complete, the NSS Enterprise will be the first 3D printed airframe bound for space, where it will likely achieve other firsts. The spacecraft will house space-focused projects from students at all educational levels hailing from all over the world. NSS Enterprise will communicate with the students about the status of their experiments using natural language via 'Ali,' a cloud-based artificial intelligence platform designed by Value Spring Technology, Inc.
"Ali will be the voice and mind of the NSS Enterprise, communicating with her virtual crew just as the computer aboard the Star Trek ships did, in natural language, through the student teams' own Internet terminals," said EIS Program Manager Alice Hoffman. "Through the EIS project, we hope to demonstrate that Ali can become a personal tutor and mentor to every student, allowing them to see the vision of a brighter future and providing them with the education to fully participate," she said. The next phase of the design process is for the engineering development and specifications to be made from Von Medvey's design. Then construction on the vehicle can officially begin. EIS will also host international challenges to begin selecting K-12 and university experiments to be installed aboard the spacecraft. 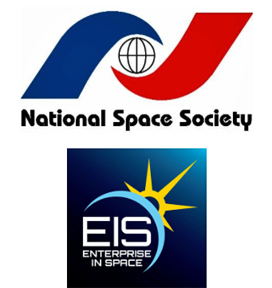 Follow the progress of this historic EIS project—from winning entry, through engineering design, to construction and flight—at http://www.enterpriseinspace.org.